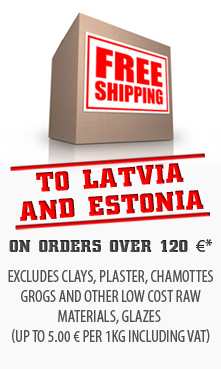 You are here: Home Product Catalogue Glazes for ceramic Czech glazes - 30% DISCOUNT FOR ALL G, GM, GMU and GU GLAZES! The ceramic glazes are milled glass of a special composition with the addition of kaoline, ceramic pigments, colouring oxides, tarnishing agents and other ingredients. They are designed for the surface treatment of ceramic products, above all for the ensuring of the tightness, for the increasing of chemical and mechanical reseistance and for the improvement of aesthetical characteristics. Do not miss the chance to buy glazes cheaper! 30% DISCOUNT FOR ALL G, GM, GMU and GU GLAZES! The discount will be applied to the invoice.